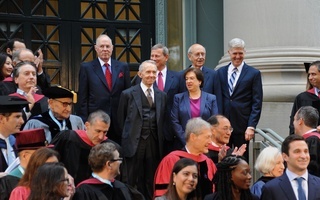 A month after his light-hearted appearance at Harvard Law School’s Bicentennial Summit, U.S. Supreme Court Chief Justice John G. Roberts ’76 was all business when he returned to the Law School Tuesday night to preside over the final round of the Ames Moot Court Competition. The annual competition is over a century old, and for the finalists each year, it represents the culmination of a lengthy process that begins their first year of Law School. 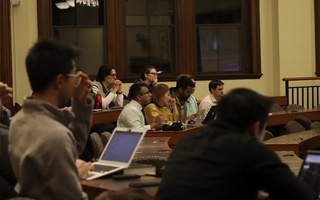 After several rounds of elimination, the remaining two teams of six students argue before a bench of three professional judges that often includes a Supreme Court justice. 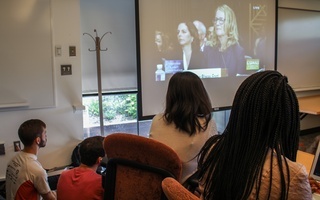 In addition to Roberts, Judge Debra A. Livingston of the Second Circuit Court and Judge Carl E. Stewart of the Fifth Circuit evaluated the students. Before announcing winners of the competition, Roberts urged the audience to consider the difficulty of the task the competitors had just completed. 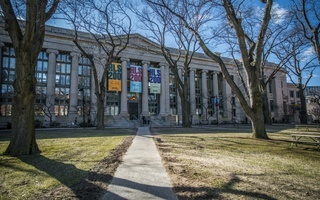 Former Dean of Stanford Law School Kathleen M. Sullivan, who won the competition as a student at Harvard Law School in 1981 said that the event was as “electric” as when she competed. “If anything I would say the students are smarter, wiser, and better prepared than we were when we were students,” Sullivan said. David Phillips, a third-year student, won the award for best oralist for his arguments before the moot court. The teams argued a case about gender equity in the military draft process.